Guess Who’s Making Beer? Ben and Jerry’s! Yes, They Are. First, a public service announcement for those who live anywhere near a Ben and Jerry’s: Today is their 26th annual Free Cone Day, which, if you are unfamiliar with it, involves every Ben and Jerry’s store in the country handing out free ice cream cones to anyone who shows up. We continue to be shocked that it has not yet achieved national holiday status. But if you can’t spare hours of your workday to wait in line for a cone, here is something that may be even more exciting: Ben and Jerry’s beer. 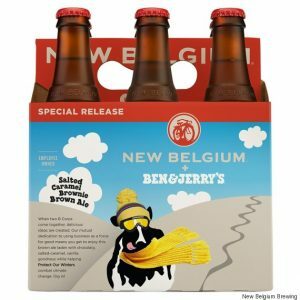 The Vermont hippies are teaming up with the Colorado do-gooders at New Belgium to make Salted Caramel Brownie Brown Ale.